(Nanowerk News) Approximately two million years ago a star exploded in a supernova close to our solar system: Its traces can still be found today in the form of an iron isotope found on the ocean floor. Now scientists at the Technical University of Munich (TUM), together with colleagues from the USA, have found increased concentrations of this supernova-iron in lunar samples as well. They believe both discoveries to originate from the same stellar explosion ("Interstellar 60Fe on the surface of the Moon"). We therefore assume that the 60Fe found in both terrestrial and lunar samples has the same source: These deposits are newly created stellar matter, produced in one or more supernovae, says Dr. Korschinek. 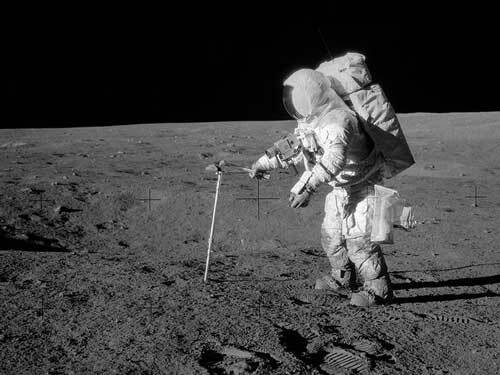 Since the moon generally provides a better cosmic record than the earth, the scientists were also able to specify for the first time an upper limit for the flow of 60Fe that must have reached the moon. Among other things this also makes it possible for the researchers to infer the distance to the supernova event: "The measured 60Fe-flow corresponds to a supernova at a distance of about 300 light years," says Korschinek. "This value is in good agreement with a recently theoretical estimation published in 'nature'." The lunar samples were investigated using the high-sensitivity accelerator mass spectrometer of the Maier-Leibnitz Laboratory near Munich. In addition to the TUM's physicists, US scientists from Rutgers University and the Planetary Science Institute in Los Alamos were also involved in the publication. Financial support for the research was provided by the German Research Foundation (Deutsche Forschungsgemeinschaft, DFG) via the Excellence Cluster Universe.